Garlic Pepper Sauce offers an infusion of garlic, blended with choice herbs, olive oil, habanero peppers & scotch bonnet peppers renowned for their distinct aromas, flavor and heat. 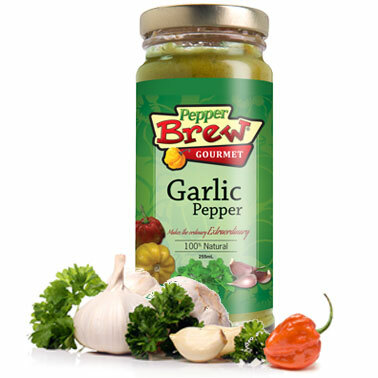 Garlic Pepper Sauce is a sauce for the avid garlic lover, without the usual overwhelming odor. Garlic Pepper Sauce is great in dips, such as guacamole; is fantastic with cheeses, in spreads, as a salad dressing, as a marinade,in stir-fries, in sandwiches or as a condimentwith any meal.